Roger Joseph ’74 (BS) graduated from high school at the height of the Vietnam War. Knowing he could soon be drafted by the U.S. Army to serve a two-year stint, he decided to have a say in his own fate. He joined the Air Force, proudly served for four years, and says it was one of the best decisions of his life. After three years, five months and seven days in the Air Force, Joseph, who became a sergeant, received an early discharge. He returned to his hometown of San Diego and transferred the credits he’d earned taking night classes along the way to the University of San Diego, where he was selected by President Author E. Hughes to serve on the President’s Advisory Council while pursuing his business degree. 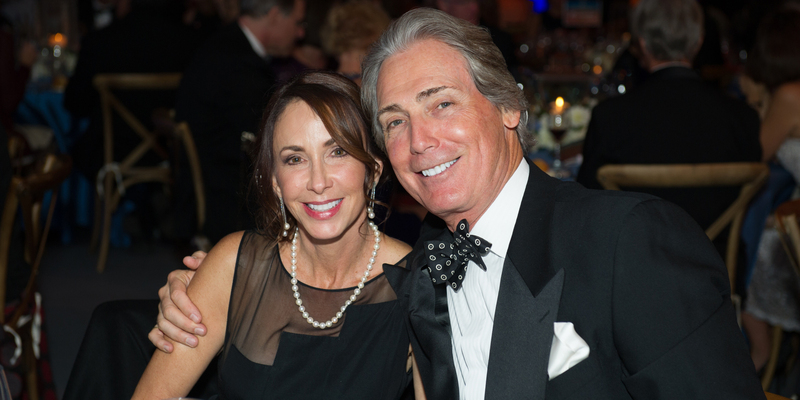 A leader from the beginning, Joseph has supported many areas of campus, including the College of Arts and Sciences, Torero Athletics, the renovation of the French Parlor and the Founders Gala, a signature black-tie fundraising event, which he has attended since it was established in 2009. The 2017 event was held on Veterans Day and, during the Fund-A-Torero Veteran portion of the evening, guests raised their paddles to establish a new scholarship fund for student veterans. The auctioneer could barely keep up as he called out bidder number after bidder number, acknowledging each donation one by one. It was no surprise that Joseph (pictured above with his wife, Tamara LaFarga-Joseph) was among the first to give. He stood up, pledged $25,000 and gave a salute that inspired others to follow suit. In the end, nearly 200 donors contributed $500,000 to the scholarship fund. Very nice article. I attended USD 1960 to 1963. Having completely run out of funds, I decided to enlist in the Air Force, same as Mr. Joseph. After four years of service, including a one year tour of duty in Viet Nam, I returned to USD for my final two semesters. Myself, and a Navy veteran friend of mine, may have been the first two Viet Nam veterans to attend USD. USD, and my fellow classmates, were very accommodating to me. Wonderful experience. I still maintain contact with many of my classmates from my era.